At some point of time , Everyone of us would have thought about improving our English Vocabulary . In this technology driven time , it might sometimes be difficult to go to a English Learning class in order to improve your English . If you are using Windows 8 , then here’s an app that can help you improve your English easily. The App name is called “English Club” that lets the users to learn English with better learning experience. The English Club has excellent content from the British Council and is published by Avon mobility. The app provides lots of fun filled language learning experience with humorous format via the animated videos . It includes basic words, advanced words, business terms, hangman, jumbled words, stories for kids etc. 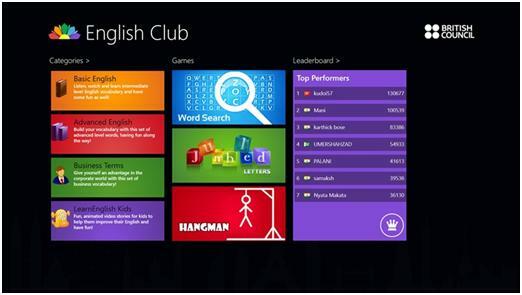 You can download British Council’s English Club Windows 8‏ App for Improving your English from Windows Store.